Monday through Sunday, 10 a.m.-5 p.m. 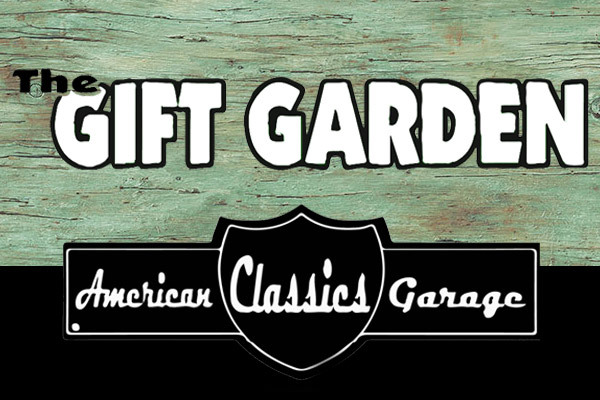 Gift Garden and American Classics Garage has been a family establishment on the Outer Banks since 1987. Whether you’re looking for a gift for a friend or one for yourself – because you deserve it – the search for that perfect item ends here! We offer a variety of products to decorate your lawn, garden, home or even yourself. Purchase home flags in every size from garden flags to banners. Our mailbox covers give a plain, old object a little splash of you. Celebrate every holiday and season with the help of our floor mats with spirits that range from cute to elegant. Dress your home with festive wreaths handmade by local artists, and don’t forget to add an extra touch with a scented candle. There’s no shortage of coastal and beach themes among our home decor and gift items. Giving them to faraway friends and family is like giving them the gift of the Outer Banks. We also carry North Carolina-sourced jams, jellies and sauces for a true taste of home. The themes of our products span beyond the Outer Banks. You’ll find thoughtful gifts for teachers, police, nurses, firefighters and other specialized fields. For fans of Hot Rods and classic cars, we also provide branded and logo swag from all of your favorite car, motorcycle and tractor brands. Don’t see what you’re looking for? Just ask our friendly staff members. We’re happy to help you find the just-right gift for everyone on your shopping list.